In a landmark 2006 judgment, U.S. District Judge Gladys Kessler found the major U.S. tobacco companies had violated civil racketeering laws (RICO) and engaged in a decades-long conspiracy to deceive the American public about the health effects of smoking and their marketing to children. Among her remedies, Judge Kessler ordered the tobacco companies to publish “corrective statements” that tell the American public the truth about the deadly consequences of smoking and secondhand smoke. Tobacco companies fought for more than 11 years to delay and weaken the corrective statements, but finally began to publish the court-ordered statements through newspaper and television advertisements in November 2017. The newspaper ads ended in March 2018, and the TV ads continue until November 2018. The tobacco companies must also publish the statements on their websites starting on June 18, 2018, and on cigarette packs starting on November 21, 2018.
the adverse health effects of exposure to secondhand smoke. There is ongoing litigation whether the tobacco companies must post the corrective statements at retail point-of-sale displays. 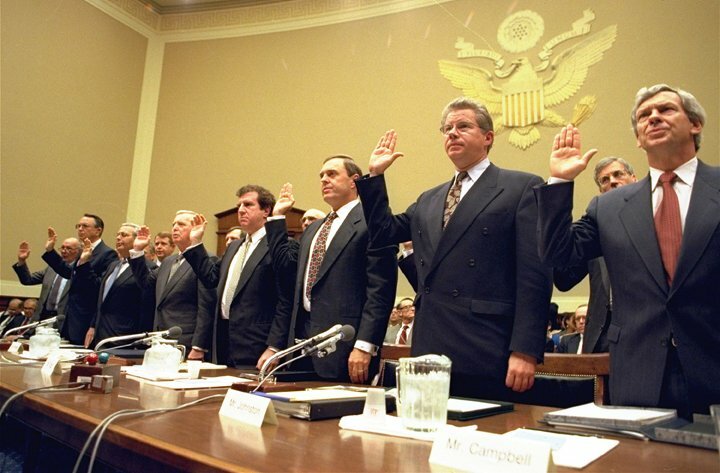 In 1999, the U.S. Department of Justice sued the major cigarette manufacturers, charging they had violated the civil provisions of the Racketeer Influenced and Corrupt Organizations Act (RICO) and other laws. Although there were originally nine defendants, because of tobacco industry mergers and other changes, the remaining defendants are Altria Group, Philip Morris USA (a division of Altria) and R.J. Reynolds (a division of British American Tobacco). The racketeering trial lasted from September 2004 to June 2005. In July 2005, Judge Kessler granted a motion by several public health groups to intervene in the case in order to argue for strong remedies. These groups are the Tobacco-Free Kids Action Fund (a 501(c)(4) affiliate of the Campaign for Tobacco-Free Kids), American Cancer Society, American Heart Association, American Lung Association, Americans for Nonsmokers' Rights and National African American Tobacco Prevention Network. In May 2009, a three-judge panel of the U.S. Court of Appeals for the District of Columbia unanimously upheld Judge Kessler’s judgment and almost all of her remedies, including the corrective statements. In 2010, the U.S. Supreme Court declined to hear appeals in the case. 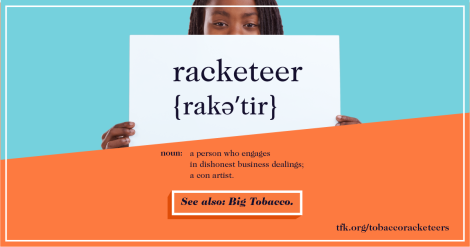 Prohibit the tobacco companies from committing acts of racketeering in the future or making false, misleading or deceptive statements concerning cigarettes and their health risks. Ban terms including “low tar,” “light,” “ultra light,” “mild” and “natural that that have been used to mislead consumers about the health risks of smoking. Extend and expand existing requirements that the tobacco companies make public their internal documents produced in litigation. Require the tobacco companies to report marketing data annually to the government. This case and the corrective statements are a reminder that tobacco’s horrific toll is no accident. It stems directly from the tobacco industry’s deceptive and even illegal practices. As tobacco companies now seek to portray themselves as responsible corporate citizens working to curb smoking, this case reflects that they are the root cause of the problem.